The holidays are here! It is now socially acceptable to listen to Christmas music 24/7, admire your lovely holiday decor, and start laughing or shaking your head at all of the antics those elves are getting themselves into on your Facebook feed. If you’re like me, Thanksgiving, Christmas, and Easter are some of the only days during the year that you bring out the “good stuff” for family gatherings. No paper plates and napkins in my house. After all, someone was kind enough to gift us that expensive silverware and monogrammed cloth napkin set, these should be put to use and here is why. I have a beautiful set of glasses that belonged to my grandmother. These glasses live in my cabinet safely tucked away. I’ve never used them, not once. One day I came home from work and nearly lost it when I saw one in the dishwasher. Don’t you see that these were placed on the highest, most hard to reach place for a reason? I’m so fearful of breaking one that I don’t use them at all…and I hate it. Dishes are made to be used. In this case, it is not the dish itself that holds me back, but the sentimental value I have placed on the set. They are irreplaceable. With the exception of sentiment, the minimalist is me contemplates, why own anything if you’re not going to use it? For that reason, when we got married we only purchased everyday china and you know what? We use it every day. The same goes for our silverware. Although it’s not technically silver, it is very nice and actually holds up way better to daily use than the cheap set I bought many years ago. Money well spent! However, when the holidays come around, it’s nice to make it special. This was the first year that Mr. P and I served as hosts for Thanksgiving dinner so I wanted to dress up the table a little bit more than just our everyday set of dishes. I searched our cabinets and pulled out the water goblets and the monogrammed napkins. It was the first time either gift had seen the light of day since our wedding. I love our monogrammed cloth napkins from Williams-Sonoma. 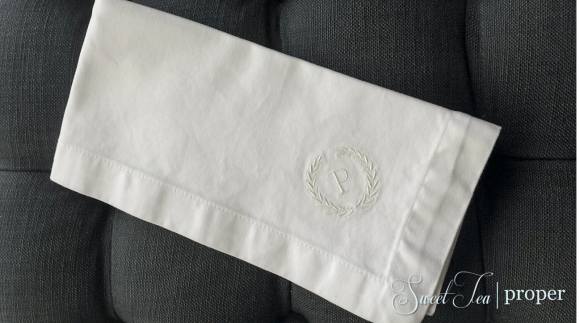 They are white napkins with an ivory embroidered laurel wreath and monogrammed “P”. It’s amazing how the small touches can make such a big impact, but they do. I was a little apprehensive about letting the kids use the cloth napkins, but hey, they’ve got to learn table manners at some point. This must not have been the right year because two of the napkins received hard blows in the form of sweet potato casserole. Luckily, I was able to get most of the stains out of one of the napkins. *Sigh* At least we used them. Now that the napkins have been used, there are certain things you can do to make it easier to use them again. First, if there are stains, try to treat them as soon as possible. The sooner you can get around to treating it (without embarrassing the guest who made the stain, of course), the greater your chances are of getting the stain out. 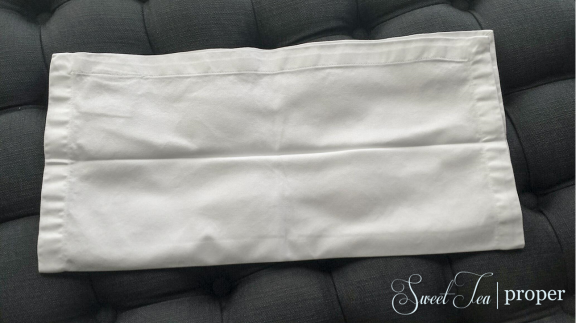 Once treated, follow the directions specifically stated on your cloth napkins. 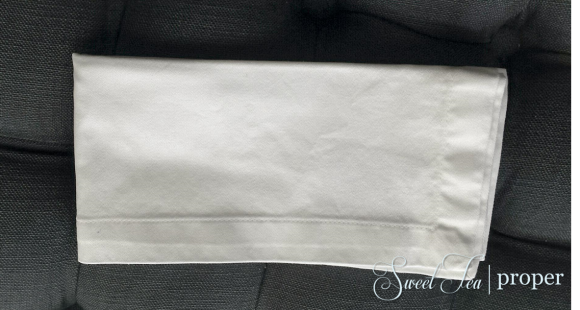 Our napkins can be washed on delicate and dried on low in dryer. If you have an older set, you might need to hand wash and lay the napkins flat to dry. After the napkins are dry, you probably noticed that they don’t have the same appeal as when you first received them. That’s because even if you used the dryer, the napkins will still need a good pressing with the iron. You could skip this step until you need the napkins again, but trust me, it’s better to do it now. You just never know when an unexpected dinner guest will come over and you will never regret being prepared. Step 1: Set your iron to the appropriate heat setting (probably cotton or linen) with light steam. 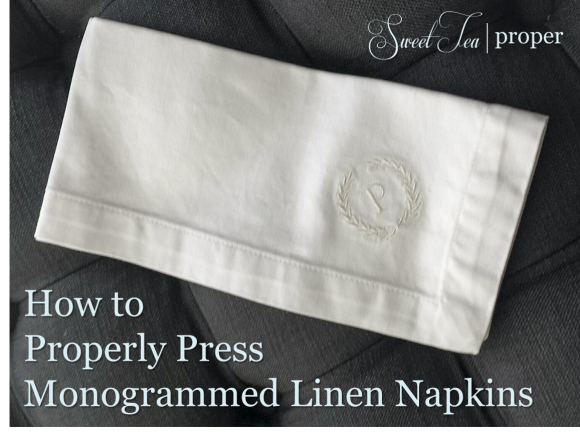 Step 2: Place your napkin on the ironing board (monogram side down) and iron out all of the wrinkles. *STP Tip: I like to place the monogram in the upper right hand corner during Step 2. Wherever you decide to place it, make sure that it’s in the same place for every napkin so the set will be pressed uniformly. Step 3: Take the bottom of the napkin and fold it to the top. Press the napkin to create a crease. Step 4: Fold the bottom to the top again and press firmly to create a second crease. Step 5: Take the left side of the napkin and fold it to the right. Press the napkin again. 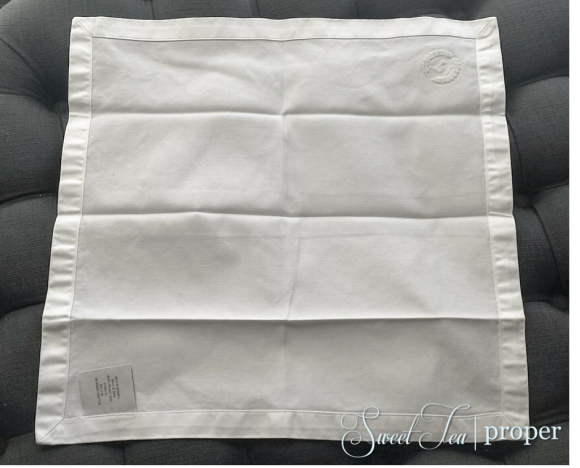 Step 6: Flip the napkin over and lightly press the front, making sure to avoid the embroidered monogram. That’s it for this tutorial. Your linen napkins are now perfectly pressed and ready to use at your next dinner party!